Every fifth Bulgarian is spending their summer vacation at home and the reason is mostly the lack of money, a survey by the Bulgarian daily “24 Hours” said. 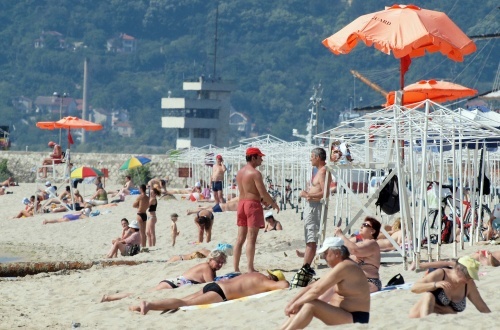 The survey conducted between July 2-7 among 540 Bulgarians in 22 cities showed that in comparison to 2007, the percentage of people staying home for their summer vacation has increased 4 times. The group of the vacationing Bulgarians have decreased to 56% and about a third of them have already taken their vacation. “24 Hours” have taken into consideration the fact that the respondents have been citizens of the biggest cities in Bulgaria and claim that if the survey has been conducted in smaller towns and villages, the number of vacationing Bulgarians would have been much smaller. However, the survey shows that the number of people, undecided whether to go on a vacation or not, has increased from 1% in 2007 to 18% in 2010. It also claims a change in the time of vacations with June being a desired month for 17% of the Bulgarians this year, in comparison to 11% three years ago. About 20% of the respondents have stated that the lack of money is the reason for them staying at home, while only 6% have claimed they were not allowed to take a vacation from work. Those who are able to take a break from work though, have been allowed a holiday of 1 to 2 weeks maximum. Only 10% of the Bulgarians can allow to take a break for a longer period. A curious fact from the survey is that 16% of the Bulgarians are still willing to go on a vacation abroad, with 4% going on a trip and 11% - at a foreign seaside. “24 Hours” also does not record a drop in the number of people vacationing in the mountains, which is still 13%. There is a drop only of the number of people who go to the villages during their summer vacation. Their number has been 9% in 2007 and is 6% this year. Even in times of crisis, the seaside is the desired vacation destination for 51% of the Bulgarians. The ratio of people vacationing at the Bulgarian seaside to the people going to a seaside abroad is 3:1. However, the survey records a change of the place for stay at the seaside. This year only 22% of the respondents will sleep in a hotel, while 36% prefer a rented accommodation, which is the cheaper option. One third of the respondents have chosen to stay at old communist rest homes. The group of the camp tourists have resisted the economic crisis and remains about 1/10 of the respondents. The survey also does not record a change in the sum that people put aside for their vacation. This year it is about BGN 564, 57, in comparison to 2007, where the amount was BGN 530. However, the only change this year is that this amount includes the money put aside for holidays abroad. About 1/6 of the Bulgarian households have claimed they were ready to go on vacation with up to BGN 300. “24 Hours” stated that these people have been put in the category of people who would not skip their summer vacation, even if it is for a few days only. Every third household can afford a vacation, costing between BGN 300 and BGN 500, while every fifth household can put aside BGN 500 to BGN 1 000 for a holiday. Only 8% of the respondents have claimed they could afford a vacation that would cost them more than BGN 1 000. The economic crisis have also made people choose a shorter form of vacation, which is a weekend at the seaside. The Bulgarian Black Sea towns of Sozopol, Lozenetz and Primorsko are the most popular destinations, with an average offer for a room per night is BGN 10. At the bigger Black Sea cities like Varna and Burgas, the price for the same offer does not go below BGN 15. The cheapest hotel room in Varna costs BGN 48 for a room with 2 beds. The prices in the more expensive hotels do not fall below EUR 40. The survey also shows a new tendency for the Bulgarian Black Sea toursist, and this is the all inclusive package.